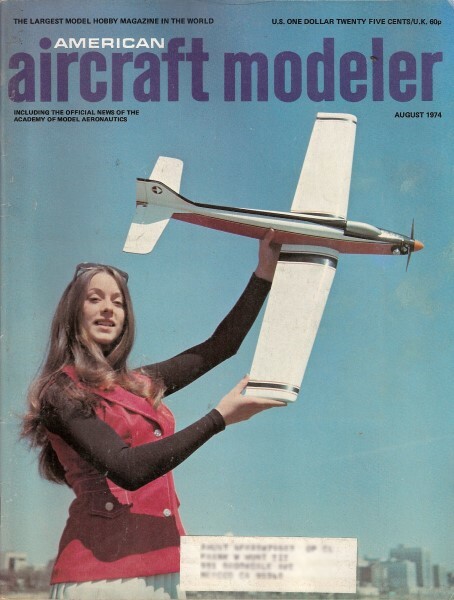 Mr. Steven S., my Canadian neighbor who has also built the So Long, Quarter Pint, and Ace Whizard models from plans found on Airplanes and Rockets, is now about to undertake the Pacer 1/2A pattern model that was featured in the August 1974 edition of American Aircraft Modeler. 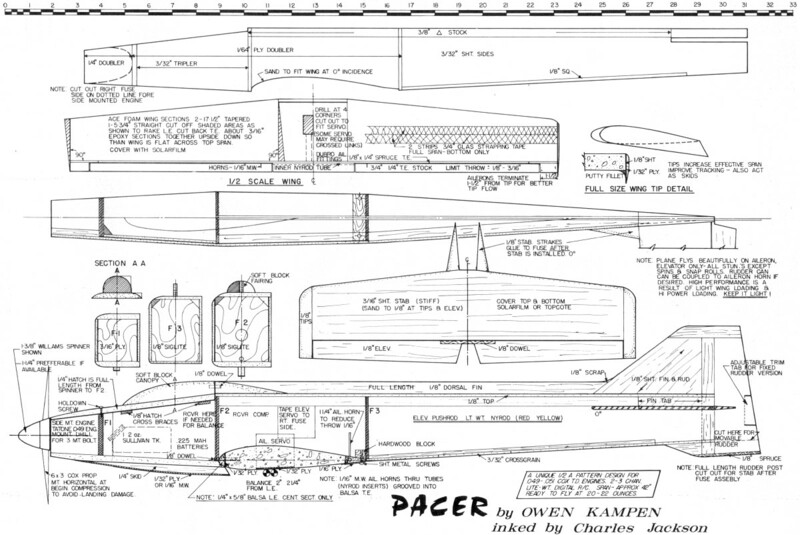 It originally used foam wings, so I'm guessing he will be drawing up plans for a balsa version, but we'll have to wait an see. I have every confidence that Steven's rendition will do the craft's designer, Owen Campen, proud. Here are some construction photos. At last, true pattern capabilities are matched to small field operation. Everyone knows about little 049-powered RC models. They are twitchy, fragile, buzzy things that dart around in a state of semi-controlled agitation while cluttering up the sky. They get in the way of the serious fliers with their serious planes. They are OK for the kids, but a grown man who wants to experience what RC is really all about with a really groovy responsive ship has to have a six-foot, six-pound, 60-powered job, complete with at least six channels. Right? ... WRONG! 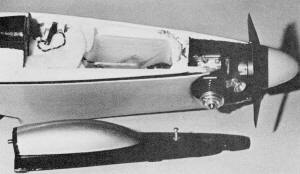 Today's state of the art has changed all this, and a new breed of clean responsive craft is on the way. They not only look like, but fly like, their big competitive brothers; and at the same time offer some very considerable bonuses. In an age of growing shortages of energy, you can now have five and ten minute flights on one or two ounces of fuel. Long weekend trips to the field can be supplemented by a walk to a nearby playground, as all you need for an hour's session can easily be carried in two hands. A few 60 pilots have been impressed enough to state their belief that this could be a great way to sharpen their competitive skills, and cut down on those 30 gallon summers. A study of the plans will indicate ease of assembly, with a minimum investment of time and money. 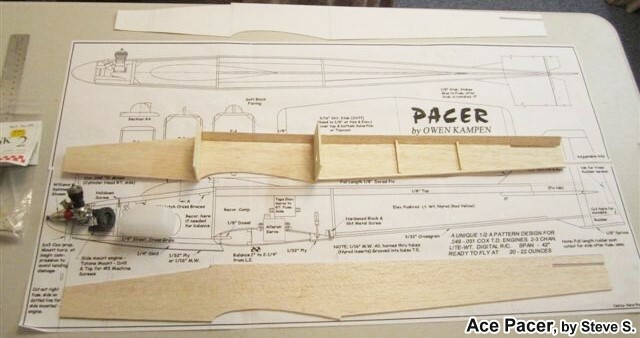 The Pacer may well turn out to be the father of this whole new family of RC craft. The concept is an audacious one, made possible by a combination of three essential elements: the availability of high-quality miniaturized RC gear, an engine capable of delivering an immense amount of power per ounce, and imagination. The three ingredients are not new; this particular combination is. In the air, the Pacer shows the classical lines of its sleek pattern lineage. Here's a design that can be honestly touted as a miniaturized version of a 60-powered competition ship. Earlier versions of the model were flown by AAM's editorial staff - it's the real thing. The one-piece hatch is removed to show the Sullivan two-oz. tank installation. Airborne batteries are located, in foam, just aft of the tank. The Kirn-Kraft needle valve ensures peak setting for the Cox Tee Dee 049. Maximum performance, as with the 60-sized jobs, requires a screaming engine. The sub-rudder is an aerodynamic necessity, but it also serves as a landing skid. The same holds true for the raked-down wing tips, which are the author's trademark. Notice anything different here? The lazy man's retract system isn't: "Let it all hang out." Rather: "Leave 'em altogether off." Aileron linkage is per usual pattern ship installation. Note that the servo is a friction and tape fit. A piece of 3/32" O.D. brass tube is slipped over the 1/16" wire horns to accommodate the horn attachments. It is not generally understood that an airplane, large or small, is first of all an idea. Sometimes vague in the beginning, the idea is filtered through past experience, practical considerations of available materials and methods, a clarification of goals, and a measure of intuition. When successful, the result is a collection of parts moving together as one to form a new entity - which sometimes, though rarely, equals or exceeds the hopes of its creator. In terms of experience, the last dozen years have witnessed the birth of over sixty original RC designs by the author. There have been successes and failures, and the latter have been the teachers. Risk is always the constant companion and, from this, we learn to enjoy the trip - regardless of the outcome. Nothing is ever wasted, for the failures are seen as a necessary part of learning to bracket the errors. Always there are the decisions, and each usually represents a trade-off - but not always. A designer often feels he must choose between aesthetics and performance which, in turn, results in either an easy-to-build "Ugly Box" or a highly complex "Slick Brick." This assumption that it has gotta be this or that is false, for the underlying premise of all good design is simply that "Form must follow function." Neither ugliness nor complexity ever made a model fly better. If either type worked well, it was not because of, but in spite of, these limitations. 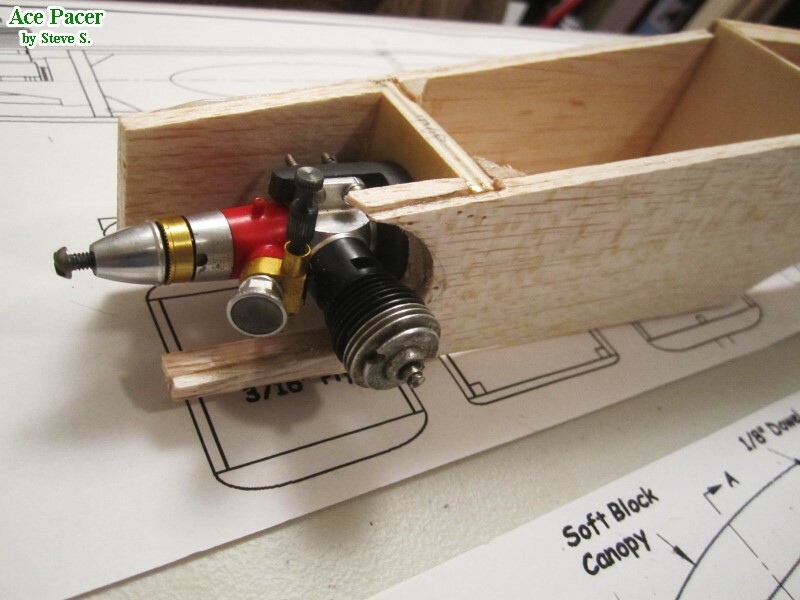 The current practice in model aircraft design is often so simple that anyone can become an expert overnight by following one basic rule: "If it don't fly too good, stick on a bigger engine." It is almost incredible how successful this method is, and surely helps explain the popularity of using larger and larger engines on increasingly smaller airplanes. Effective as the method might be, it does not really present much of a design challenge. 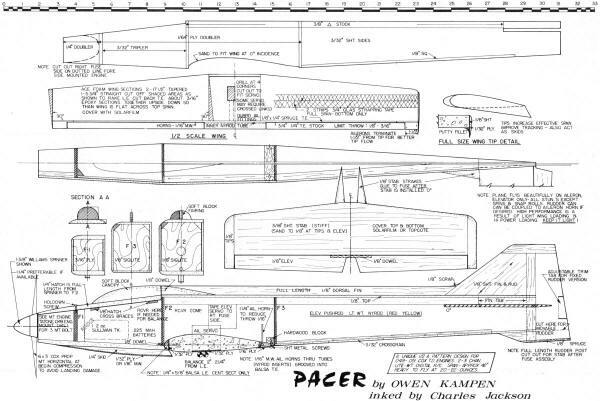 The Pacer is the result of a challenge, a desire to see how much performance could be coaxed forth, while working within the confines of an RC payload, on one hand, and the available power of the Cox Tee Dee 049-051 on the other. The goal was not to achieve a VTO trip to Mars, but rather to find a harmonious relationship of parts which would result in the superior flight characteristics usually associated with larger, high-powered pattern planes. While not a committee, several modelers were involved in the development of the concept. The plane that triggered the action was a P-51 Ace Warbird fitted with rudder, elevator, strip ailerons and a hot Cox 051. Tom Runge had brought it to Madison on a visit in the Summer of '73. His flight demonstrations included low inverted passes, and most everything else in the book. None of us had ever seen a 1/2A ship perform so outstandingly, which was a credit to both pilot and plane. Riding home from the field, a discussion among Tom, Frank Baker and myself explored the idea of taking another look at small, high-performance models, which would begin where the Whizard and Warbird left off. 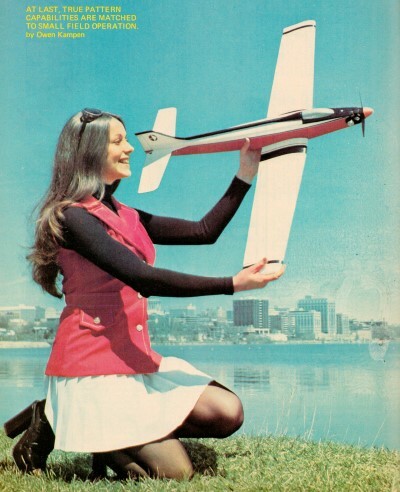 We agreed that it was well within the realm of the possible and, if successful, might be just the thing to make the small RC plane respectable. Work started the following day. While Frank proceeded with a highly modified Whizard - a cabinless mid-wing, I was approaching the problem from another angle. Under Tom's watchful eye, a new design began to take shape. All of the inherent stability of the Whizard was designed out, to achieve the desired neutral stability of a pattern ship. Moments were lengthened, to smooth out elevator response, and every part made as clean as possible. Following Romey Bukolt's Warbird lead, the retractable landing gear problem was solved in the simplest possible manner - elimination. (An old artists' adage advises: when in doubt-leave it out!) In a spirit of fun, it was called the Mach None. Two prototypes were cut before Tom left for the NATS and home. First flights of all three planes took place about the same time, with Frank and I in Madison and Tom in Omaha. All tests exceeded anything we could have hoped for, with absolutely no resemblance to any previous experience with planes of this size and power. 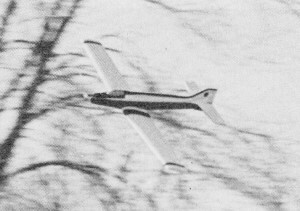 Elimination of the leading gear reduced weight and drag to a point where performance took a giant step: Large, open looping maneuvers were possible. Aileron response was crisp and precise, granting true axial control - but not at first. With airspeeds in the 60-70 mph range, response was so quick that the first flights were all over the sky, and two rolls resulted when one was intended. Some of the squarest loops yet seen at our field were caused by the mere twitch of a thumb. This problem was solved by simply reducing control surface throws. When the engine quit, the clean machines kept right on going, and none of us could hit the field with our first five landings. It was rather incredible to come across the fence at less than ten feet of altitude, and watch the damn things sail clear across the field into the brush. In time, we learned to kill off speed with a combination of dead stick loops, rolls and a nose high attitude. 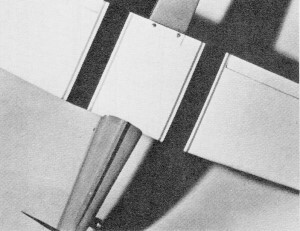 Here, the low speed stall characteristics of the Ace foam wing, in combination with light wing loadings, allowed "wheels up" touchdowns at ridiculously low speeds. Several of the more experienced pattern fliers couldn't believe their eyes, and were soon standing in line to try their hands. They quickly discovered that the major difference in technique was dictated by the visual limitations of a small high-speed model. The solution was to fly close in and lower than usual to maintain visual orientation. Strong simple color contrasts played an equally vital role in this matter. Mention should be made that only two servos were used, for while the Whizard had been previously tested on four channels, motor control was not really necessary and the rudder was rarely used. So, a decision was made to go with two. The Mach None suffered a loss of spins and snap maneuvers on its two controls, but the increased performance of the lighter wing loading made it a desirable trade. On the other hand, Frank went to a coupled aileron-rudder arrangement, which gave him the whole stunt menu with almost no weight penalty. Dealer's choice. Seeking even more, his next move was to build an 049-size Warlord (AAM Oct. 1973). Sleek and fast, the only problem was a flutter of the flying stab, which was resolved by going to a Nyrod linkage. Meanwhile, back at the drawing board, my new one was coming into focus as a direct result of Tom's urging. 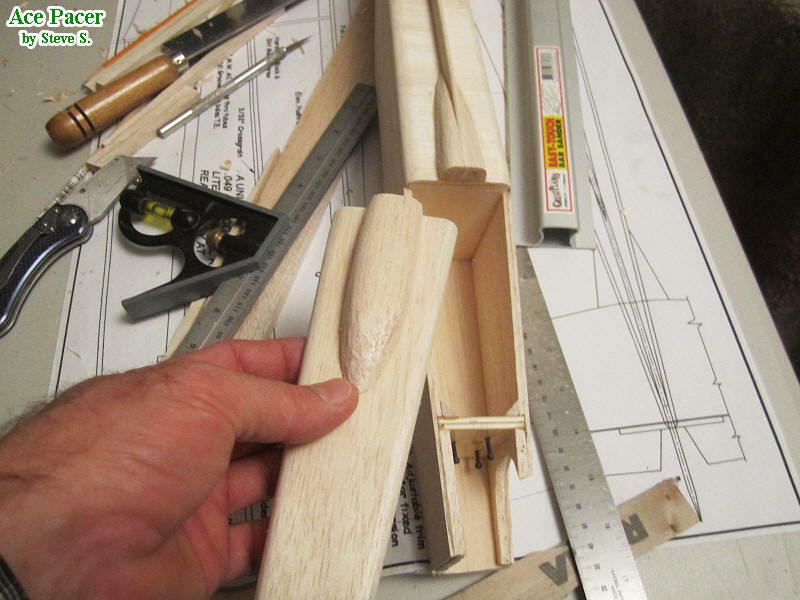 Goal: a simpler, stronger construction involving less building time; elimination of rubber band wing hold-downs, and an even cleaner collection of parts designed to stretch performance closer to the ultimate. As some of you alert ones may have guessed, it was called the Pacer. It was built in one week and displayed at Toledo, along with Tom's new Mach None. The reviews were raves, although a few die-hards doubted the performance claims. Now it's up to you to convince the doubters in your group. One flying session should do it. For over a decade, the Cox Tee Dee 049 and 051 engines have set the standard of world excellence. They have no competition, for no other manufacturer has been able to top the jewel-like perfection of these tiny power sources - machined to six millionths of an inch tolerances on highly automated equipment. Every free flight and UC speed competitor has known this for years, but the RC flier, with his increasing obsession for larger, more expensive and complex power plants, seems to be the last to know. Now a word of caution, for those of you who believe that "more is always better," and are already making plans to put a 10 or 15 engine in the Pacer to "improve" its performance: Don't! First, fly it as designed and discover for yourself what this package can do. Then if you insist on "moving up" - be prepared for a disappointment. Romey Bukolt has done it with similar types of planes, and reports that the Max 10 produces little improvement, while increasing all-up weight considerably. A Max 15 has also been flown and, at this point, all resemblance to "flying" ends and "rocketry" begins. Here, the carefully considered collection of parts is destroyed and you are on your own. 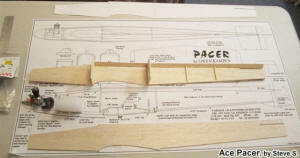 Ace Pacer under construction by Steven S.
Pacer top front balsa block ready for carving. Pacer top forward deck and canopy. 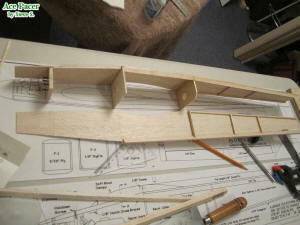 Pacer vertical fin and rudder. All flight tests were conducted using the Ace Digital Commander and two Bantam servos. Performance was flawless, and weight kept to a minimum. The advantage of this system is the ability to adapt the flight package to any transmitter, thus eliminating duplication. 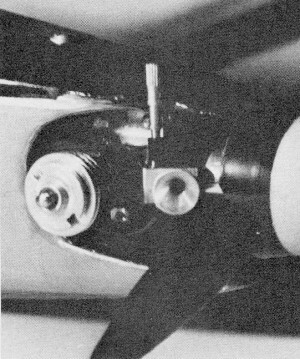 The elevator servo was mounted to the fuselage with tape. Aileron hook-up prohibits the use of Bricks. In any event, avoid the use of the larger RC systems, as a light wing loading (less than 14 ounces per square foot) is critical to optimum performance. The following will be kept to a minimum, for several reasons. (1) This is not a beginners' model, and should not be attempted by those with little experience. (2) The plans are quite complete and reasonably self-explanatory. (3) The author has an aversion to reading (and writing) one more tedious piece on how to glue stick A to stick B. Construction is as simple and direct as possible, which results in an absolute minimum of building time. Author's Note: A prolonged winter in Wisconsin made it advisable to ship the plane to the warmer climate of Missouri for first night tests. Wing: Three sections of Ace foam wings, two tapered and one 5 3/4" straight piece, are available from Ace RC. These are cut as shown on the plans, to achieve a raked leading edge. 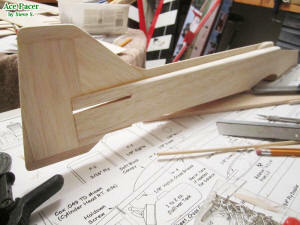 The trailing edge stock should be 3/4 x 1/4", to fit the airfoil contour. Five-minute epoxy works fine for all foam to foam joints. The glass strapping tape is essential for wing stiffness, and can be carried over the top if inverted maneuvers are your specialty. Wing covering is a must, and here Solarfilm fills the bill best, with its combination of light weight and low heat requirements which prevent foam melting. A wide variety of colors are available, but light, bright ones are best for visibility. Avoid gaps between wing and ailerons; Solarfilm hinges were used on the original. The Hoerner-type wing tips are a little extra work, but they definitely contribute to low-speed stall characteristics and certainly improve tracking. Note: Foam wings vary slightly, so make sure that the wing is mounted with 0° incidence. Measure center of LE to center of TE, and line up with the stabilizer. 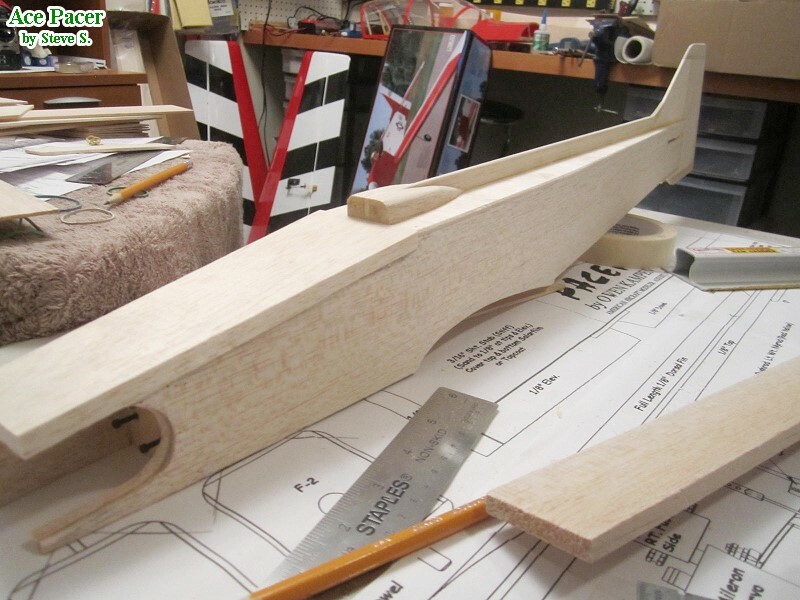 Fuselage: Basically this is a round-shouldered box and, once all doublers are contact-glued in exact position, you are almost there. Note the full length rudder post, which is installed in one piece - then cut through for the stab to slide in place. Make sure that the dorsal back and fin are true on the centerline. The original has a side mounted engine for a cleaner profile. Make sure the needle valve faces UP! This can be done easily by simply loosening the venturi and reversing the needle valve assembly. 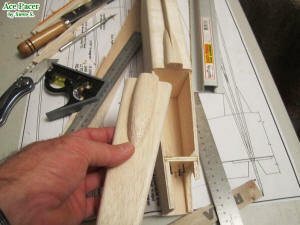 Tail: Use reasonably stiff balsa, and cover top and bottom to prevent warps. That's about it. Now there's nothing more to do except wait for the first guy to come up with a 60 version. Good luck, Pioneers! The author expresses a large thanks to Tom Runge-who contributed so heavily to this production. 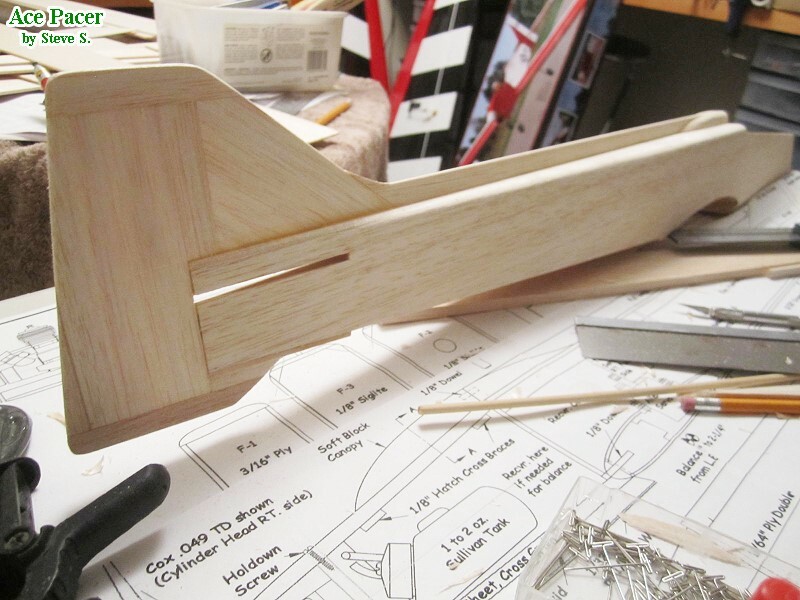 Trim-With wing/stab/thrust at 0°, and CG at 2 1/4" plane flies straight and level with all surfaces in neutral. Inverted flight requires only slight amount of down trim to maintain level flight. Turning-Quick, linear response from neutral. Makes groovy, sweeping elevator turns, characteristic of a low-wing, performance airplane design. No tendency to fall off in steep bank turns. Roll-Performs sustained axial rolls, with a minimum of down elevator in inverted position. Roll rate is fast enough to do three rolls in less than 100 yards. Inside & Outside Loops-has enough power to do nice big graceful loops. Horizontal, Cuban and Reverse Cuban Eights-no problem! Top Hat-without a throttle, gets awfully fast on the downhill leg, but will do. Spins, Snap Rolls, Four-Point Rolls - rudder is necessary. The pilot is not competent beyond this point, but plane is capable of more. The plane glides amazingly long and flat. Even though I was expecting it, I still overshot the runway on the first flights. Ailerons remain effective up to stall speed, which is very slow (less than 15 mph).